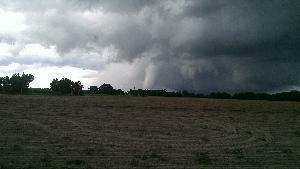 Last Saturday when we returned from the Farmers Market, we heard some ominous rumbling out yonder. The weather report did warn us that rain was coming, but those deep gray just looked like any other coastal storm. Then the rain came. It opened up like a monsoon, gushing gallons of water down the roof, flooding the grassy “lawn” behind the house so it looked like a lagoon. The winds were blowing rain horizontally from east to west, and we saw leaves, debris, chairs…all flying in front of our view. It was beautiful. Sorry I didn’t capture anything on camera – it was incredible. Turns out it was a tornado…which hasn’t happened in these parts in decades (Here’s the local news report with some great photos). We were only a few miles from where it apparently touched down — sorry Dad, I didn’t have the rain gauge out, but I read that there were 6 inches of rain reported a bit north of the touch down spot…I bet we had almost that much. Unfortunately, those incredible winds did more than merely spread debris all over our front porch. They also blew over our lovely trellises, uprooting half of our melon and cucumber plants along and pulling them down along with. Thankfully, our tomato plants are so lush and dens, they kept themselves up in the torrent, but our bean poles went a bit wonky as well. I suppose it could have been much worse, but it was sad to see those baby watermelons severed from the plants. We righted the trellises and tried to replant the roots, not expecting much. A couple of melons were already nearly full size so we brought them in and sliced them up, enjoying our first melon of the season! 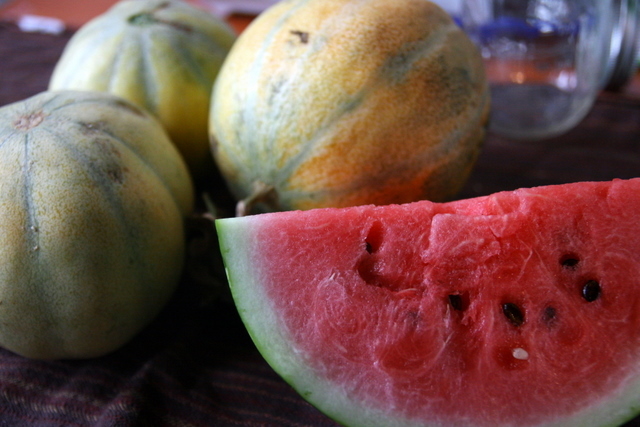 The watermelon truly is oh so sweet. Later in the week, I inspected the scene and found that as expected, none of the melons or cucumbers we had tried to replant managed to survive. Plenty had come through the storm, roots intact, but I noticed that in the melee of overturned trellises, many of the still adolescent fruits had gotten knocked around and the stems were largely detached. Now a few days later these cantaloupes were smelling wonderfully sweet and starting to turn orange. So I picked all 9 of them (small though they were) and brought them inside. Now the house smelled like a Bath & Body Works – Cucumber Melon essence everywhere. So I scoured my canning books to find some way to preserve them before they went to mush. Enter Cantaloupe Preserves. I found the recipe in Put Em Up! by Sherri Brooks Vinton. Have you ever heard of such a thing? I realize now, in the world of jamming, that you can probably make any fruit into a jam — this one pretty much follows the basic fruit jam recipe on any pectin box: 4 cup fruit + some water, 1 cup sugar, 1 packet pectin, 1/2 cup lemon juice. This recipe suggests a little cinnamon – which I confirm is delish. Easy peasy. I added in a peach I had from the farmers market that was pretty smushy, and added more lemon juice, because cantaloupe is super sweet and I need a little more tang in my jam. This morning, I woke up early to bake something to go with, and I’ve got to tell you…cantaloupe preserves on a fresh out of the oven biscuit = yum. Tags: canning, fruit, melons. Bookmark the permalink. Sorry that nasty tornado devastated some of your crops before they reached fruition. Admire your energy but also your curiosity: wow, cantaloupe preserves! Well, I’m off to the beachin Grenaa: it’s is summer in Denmark today, all day! 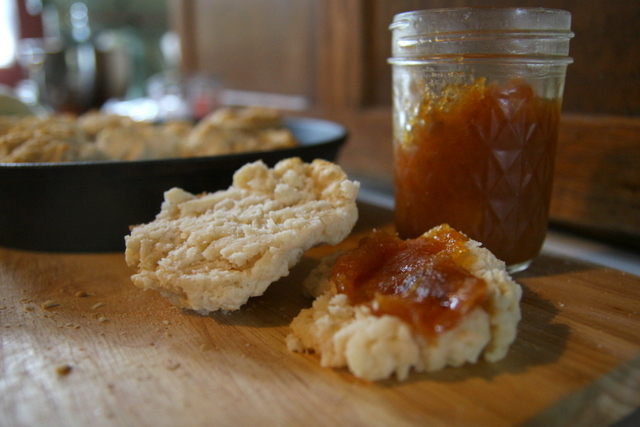 Oh my goodness, that cantaloupe jam looks amazing! So impressed!